Patrick J. Jones brings his unique teaching methods for drawing the human form to today's generation of artistsContinuing the legacy of such revered masters of figure drawing as Loomis, Hogarth, and Riley, is the highly regarded artist and teacher Patrick J. Jones. His fresh, innovative approach breaks the human body down into shapes and rhythms that can easily be committed to memory, demystifying the art of figure drawing in the process. 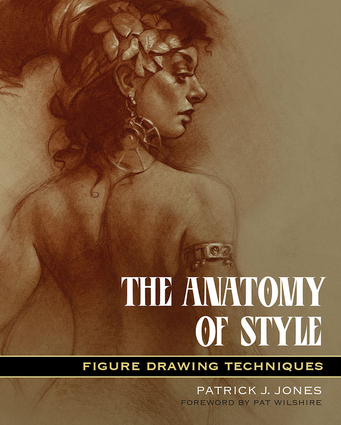 Much more than a book on anatomy: this guide explains how to use knowledge of the human form to produce drawings with style and grace, using pastel, pencil, and charcoal techniques and tools. It features reproductions of the original anatomy sheets and figure drawings produced during Patrick's live lectures, and is packed full of insights from a modern master of anatomy. Offering plenty of practical instruction and insights for digital painters, this resource will also enhance the drawing and painting techniques of figurative artists, animators, and students at every level of experience. Patrick J. Jones is an award-winning sci-fi and fantasy artist and teacher. His work is collected and published worldwide and his client list includes companies such as Disney, Lucasfilm, and Roc books. He is the author of Sci-Fi & Fantasy Oil Painting Techniques. Pat Wilshire is the cofounder of IlluXCon.